” Donald Trump – Kim Jong Un Summit Meeting, June 12, – Count not the Chickens before they are Hatched ” June 8, 2018. 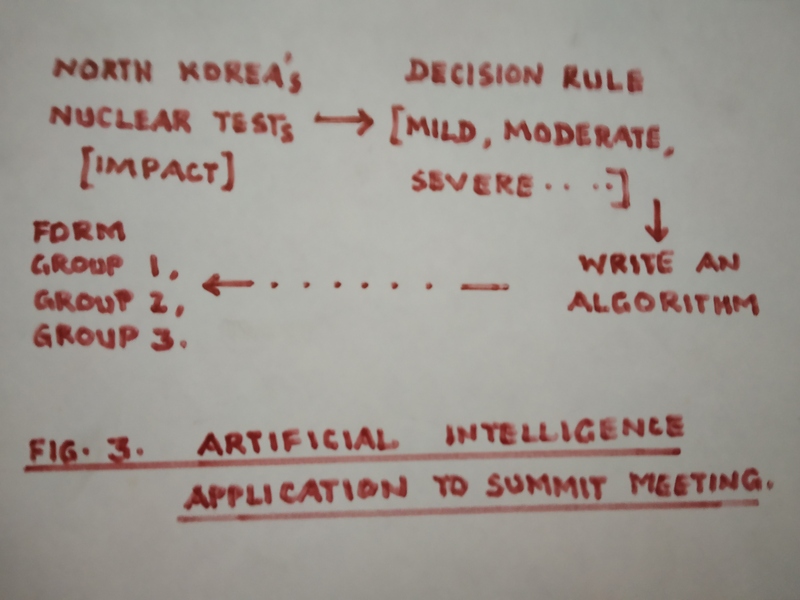 Amidst the public knowledge affording strong and conclusive evidence of the fact that North Korea has a history of not abiding by the promises made anytime before, the much anticipated Summit Meeting that was cancelled on May 24, 2018, but revived 8 days later, will now be held in Singapore on June 12, 2018 at 9 a.m. (local time). The Summit Meeting will be held in Sentosa’s Capella Hotel. Reactions and speculations from planners, administrators, media, and analysts still remain wavering. President Donald Trump’s inner voice seems to be warning him of ‘no major breakthroughs’ out of the Summit. 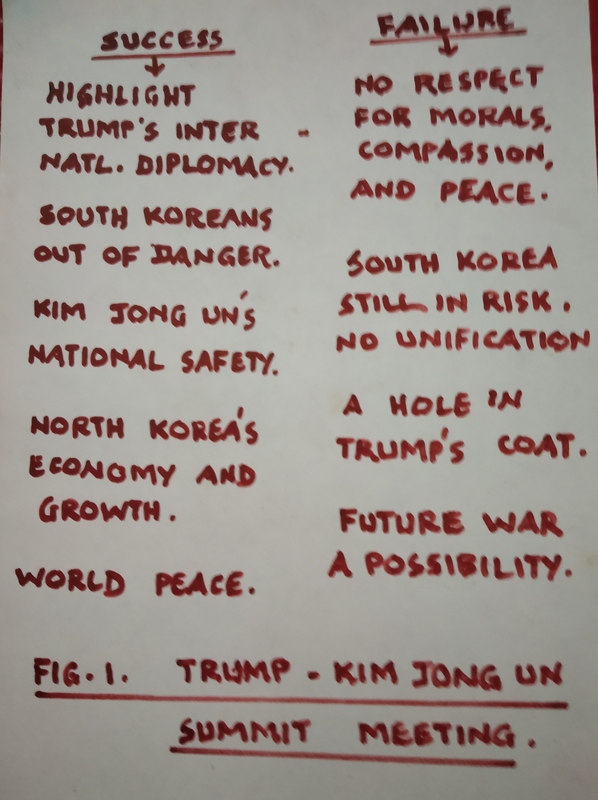 The sticking point, no doubt, is the CVID condition ( Complete, Verifiable, Irreversible, Disarmament of North Korea’s nuclear program/Arsenals). U.S.A., South Korea, Japan, Canada, Britain, Australia, and France hold a coordinated submission i.e. (CVID). North Korea is not expected to call a halt to its nuclear ambitions. Also, having already caught his hare in terms of legitimacy from President Donald Trump’s acceptance to share the discussion table in Singapore, Kim Jong Un holds his head firmly on his shoulders to seek more concessions from the U.S.A., even as Donald Trump is harping on the one string, i.e. CVD. South Korea is optimistic. South Koreans in Singapore hope that the meet will be a “security breakthrough” on Korean Peninsula. Japan is concerned about the abductions; breach of airspace and associated threats. The outcome of the Summit, in a sense, may well depend upon whether U.S.A., South Korea, and Japan stand together or not. 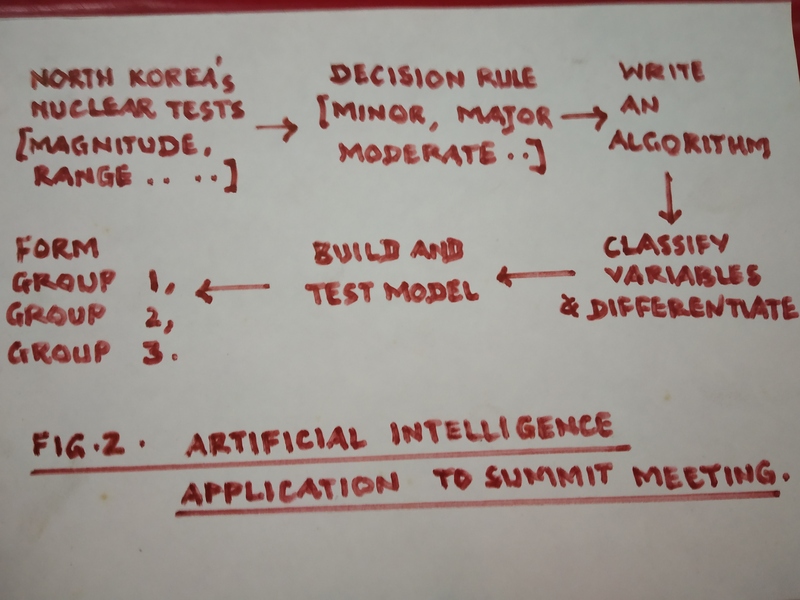 Figure 1. below depicts the elements of success and failure of the Summit Meeting in the form of a flowchart. 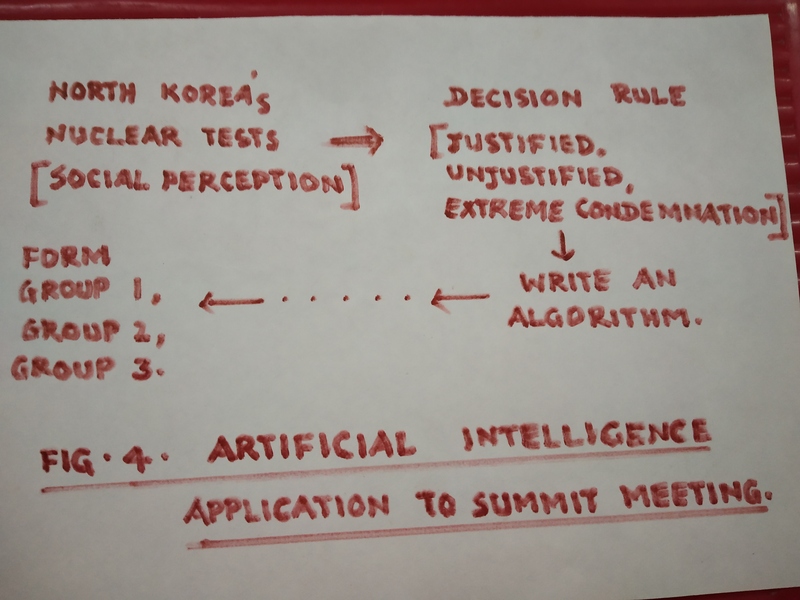 Figures 2 – 4 below suggest a simplistic representation of an Artificial Intelligence application to the diplomatic Summit Meeting. Figure 2 deals with the ‘Severity’ of the tests; Figure 3 deals with the ‘Impact’ ; and. Figure 4 deals with the ‘ Social Perception’. President Donald Trump has set his heart on a positive outcome from the Summit Meeting. A legacy achievement; enhanced national image; and the likely better performance in the mid term elections (November 6, 2018), notwithstanding, should the meet fail, it can spell serious trouble with even unpleasant consequences of staining his reputation furthermore. Path to normalisation, and future (even if prolonged) discussions on relationships may well be the crux of a “joint statement” at the end of the Summit Meeting. This may well be in order given the frequent internal and external uncertainties that shrouded the meet since February 2018. 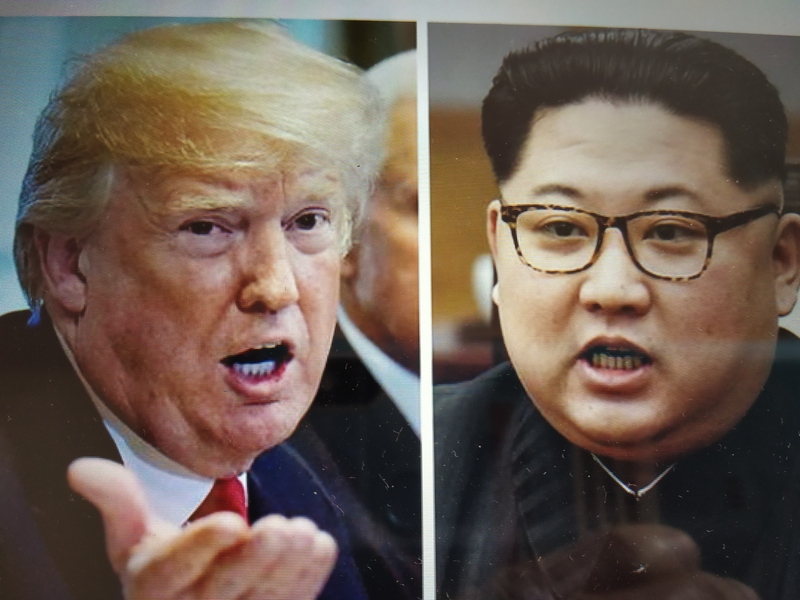 Will two unpredictable leaders signalling a change in the attitude at the end of the Summit Meeting (this may be the real outcome finally) constitute a great feat is what observers cogitate now. Friday, June 8, 2018 – 6. 39 p.m. (IST).